It’s time to set up your mixer stand, throw on a fancy apron, and start cooking! 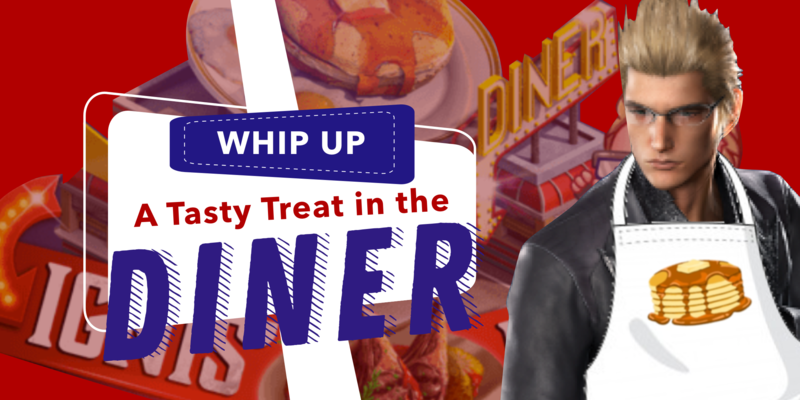 The Diner has come to EOS ready to bake and broil some amazing boosts! The Diner is building where you can create temporary boosts to benefit your account. Unlocking the Diner requires an unlock (which must be purchased at this point). 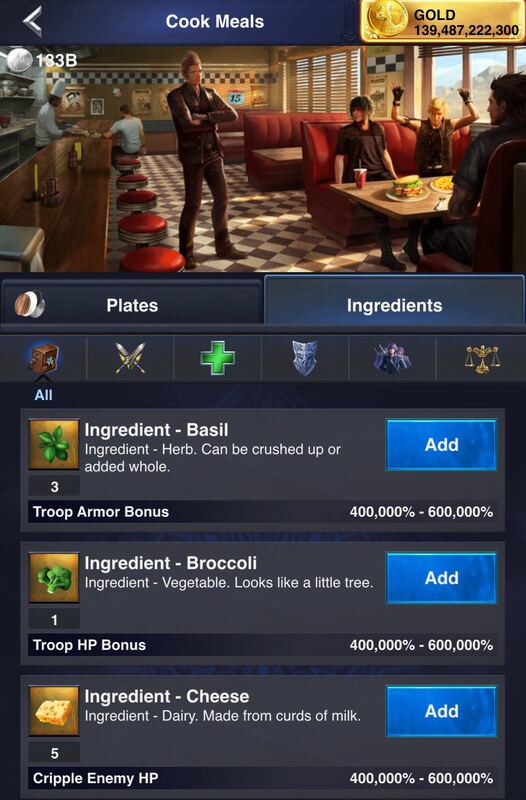 You will cook meals using only the Plates and Ingredients with the stats you want. Depending on Diner level, one Plate and up to 6 Ingredients can be utlilized. Each Meal is timed, and the duration is based on Diner level, up to 8 hours. Many of you have asked “Why a Diner?”. Fun fact, Ignis is the cook in the original Final Fantasy, and loved coming up with new recipes to feed friends. 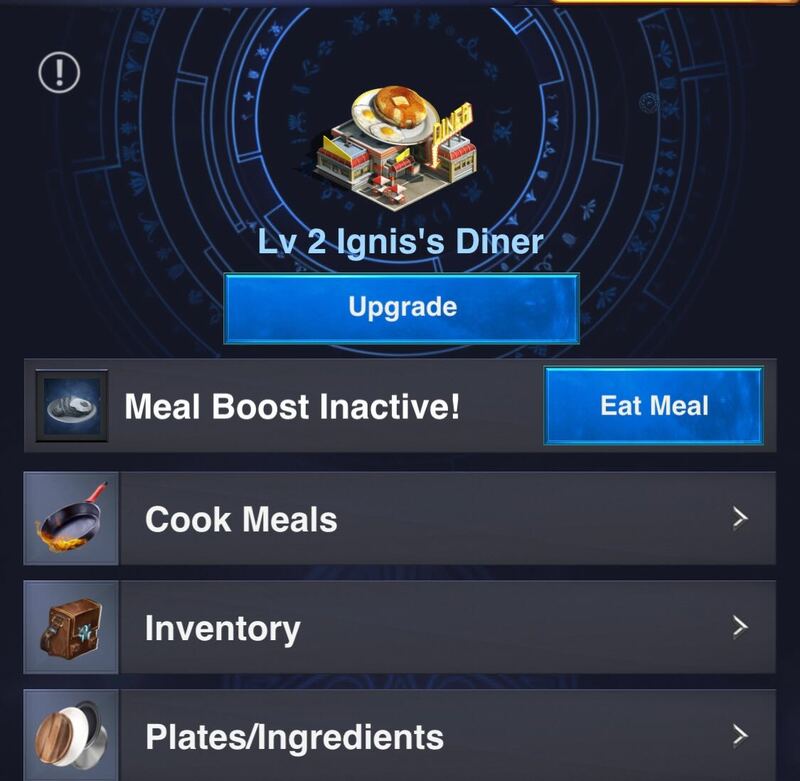 Each level requires 2,000 Ignis’s Diner Blueprints and T1 resources, and increases the duration and/or number of slots you have for ingredients. To make a meal you start with one Plate and add Ingredients. The stats on these have a range. When cooked, they will end up somewhere in this range. The top percentage is not guaranteed. Cook Meals: This is where you craft your meal. Inventory: This is where you see the meals sitting in the warmer. Plates/Ingredients: This is where you see what’s in the refrigerator to work with. Upon entering Cook Meals, you are presented with two tabs; Plates and Ingredients. Choose your Plate. 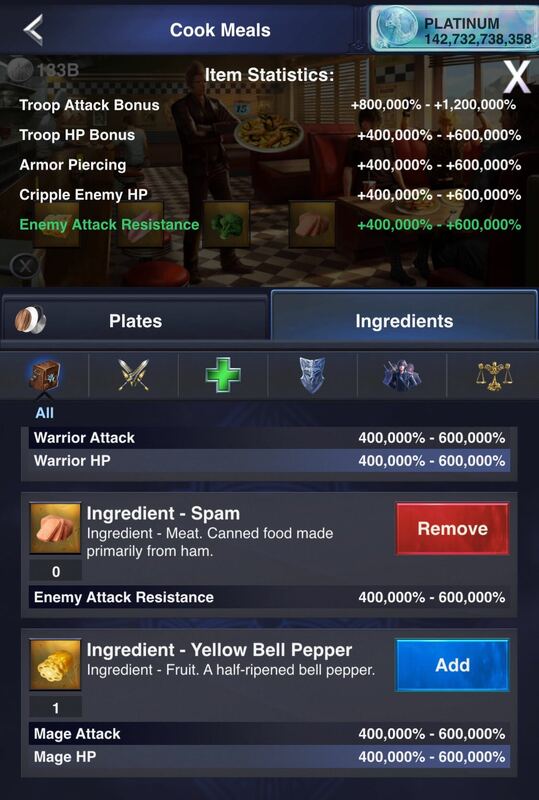 There is an option to show the potential range of stats for each Plate and Ingredient at the bottom left of the screen. This is helpful when you are cooking! Also note in the above-left screenshot, if you poke the top section of the screen it will show you what you’ve added so far. This is helpful in making sure you’re using the correct ingredients and plates you are going for. You can only add one type of each ingredient (ie, you can’t add two cheese to a meal…which is sad because cheese is life). Once you are happy with your concoction, throw it in the oven and hit the “Craft” button. As you notice below, the finished meal is within the range of available stats, you aren’t guaranteed to get the top 600,000% (and probably won’t). When you are ready to eat your meal, enter the Diner and hit the “Eat Meal” button. It will bring up a list of your available meals. Once you put the first bite in your mouth, the timer starts! 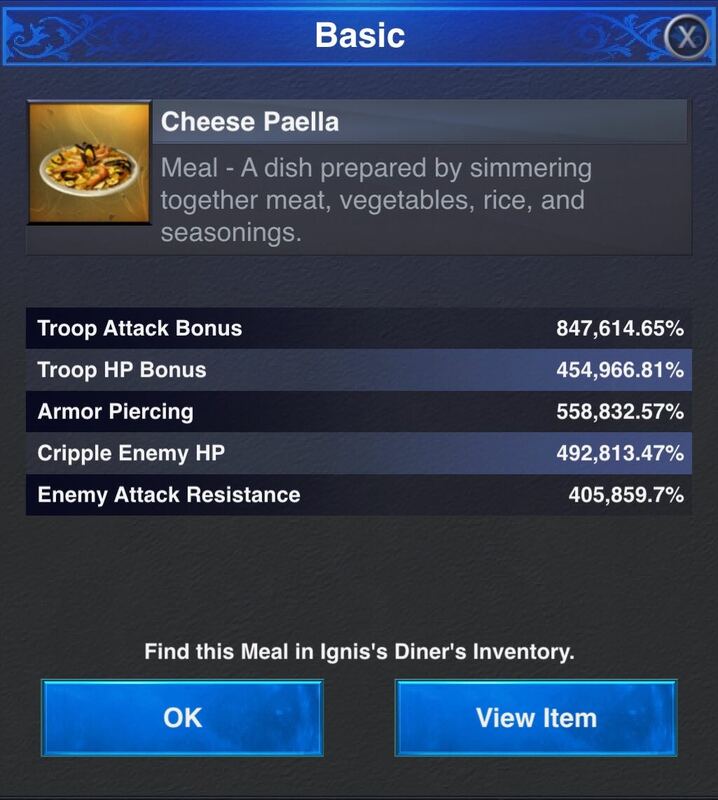 The Diner adds a new level of complexity to Final Fantasy. Take advantage of this new way to boost your stats! Do you have a tasty concoction you’ve whipped up? Questions or comments? Let us know below!